Jute Napkin Rings are fascinating items which are adorned with beads, stones, gems, and other attractive materials to augment their beauty. With their value added features, eco-friendly nature and reasonable prices, they have become quite popular among young girls. The range of jute napkin rings manufactured from jute is a wonderful artistic artifact. They are designed in a wide array of styles, patterns, designs and colors. 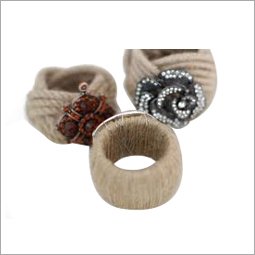 The jute napkin rings, designed from Jute, can be availed in plain, oval, twisted, or round in shape. As they are designed from Jute, they are 100% environment-friendly and biodegradable products that help people to live green. High strength and durability of these jute napkin rings make them highly admirable in the market. The sturdiness of jute assures long lasting life of the rings with no wear and tear. They need no maintenance; hence there is no need to give proper care and attention to them. Above all this, these enchanting and beautiful jute napkin rings are very economical that can be availed at pocket friendly prices.